After posting about where to find patterns for Robes a la Francaise, I thought it time to share the one I'm working on. This is "The Silver Ghost," and it's huge. I found the warm silvery brocade in a forgotten corner of our local mill end warehouse and bought it all, immediately seeing this gown in my head. Here's hoping the real one matches my imagined one! Gowns like this definitely start from the underpinnings out. 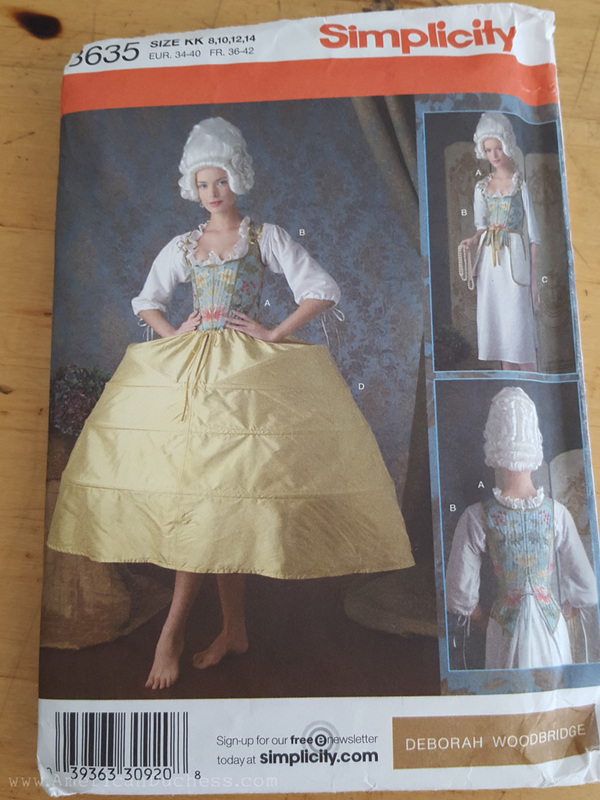 I'm using the Simplicity 3635 grand pannier I made awhile back, with some alterations, primarily that I added an extra hoop into the hem, and a ruffle to help hold the skirt out. This is very important - without the extra hoop on the bottom, your sacque skirt will not hang in that attractive trapezoidal shape. Simplicity grand pannier pattern - out of print, but still available on Etsy or eBay. My grand pannier made from the Simplicity pattern - I added a hoop in to the hem and a ruffle at the hem too. 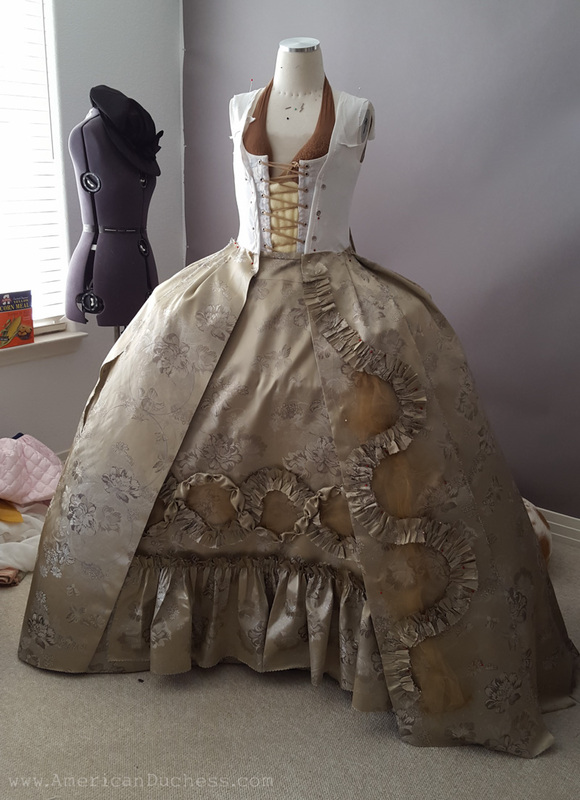 I picked up a tip from Starlight Masquerade on using the pannier pattern to cut the petticoat for the gown. 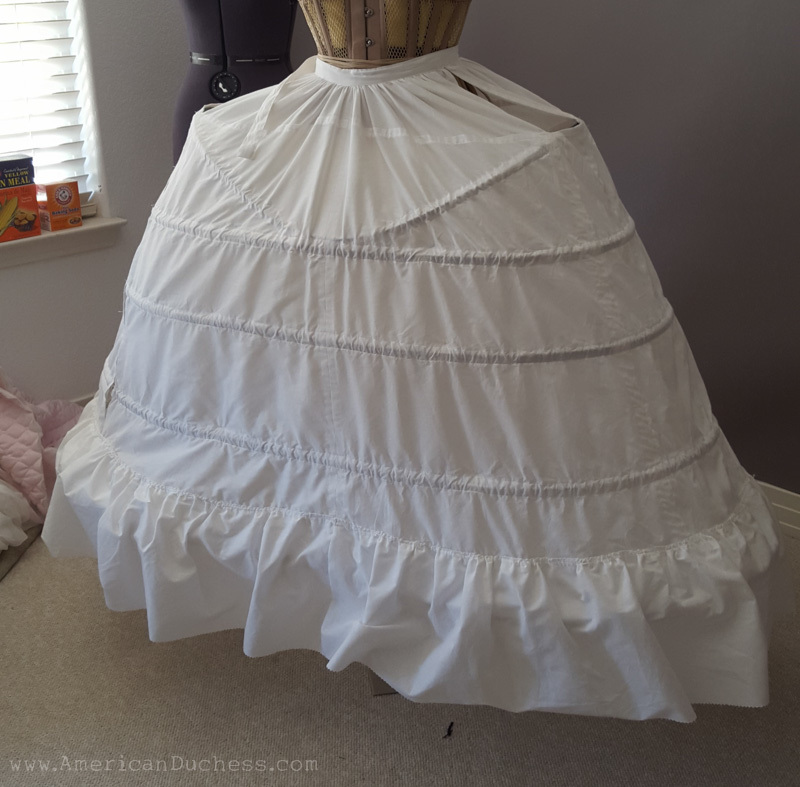 This is a *fantastic* tip - it uses significantly less fabric that a pleated petticoat, reduces bulk, and fits over the pannier absolutely perfectly. Historically accurate? No. A really good idea? YES. Using the pannier pattern to cut the petticoat. I had to extend the hem to floor length and pink up the sides a bit. The petticoat didn't take very long at all, and I had a chance to try out my trimmings on the front part. I interfaced just the front panel to keep it from collapsing under all the furbelows, then with a dish plate, drew out the circles for my trim placement. She's not done yet, as you can see, but the most challenging parts have been accomplished. The first step was the basic linen lining, with adjustable lacing at the center back, and lacing across the front of the body, which the stomacher will cover. Once onto the gown itself, I started with the back lengths/width that were pleated into the iconic Watteau pleats. I always find this part challenging, and even now I realize my technique needs improving. The back length - I ended up cutting quite a lot of this off. 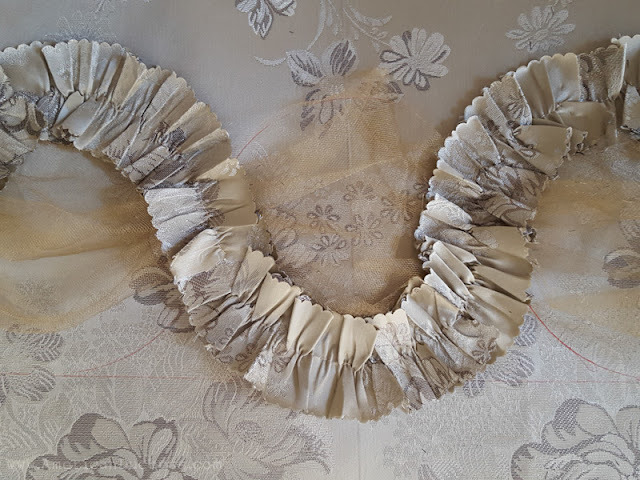 The Watteau pleats stitched to the lining at back, with the bodice piece cut out around the sides. 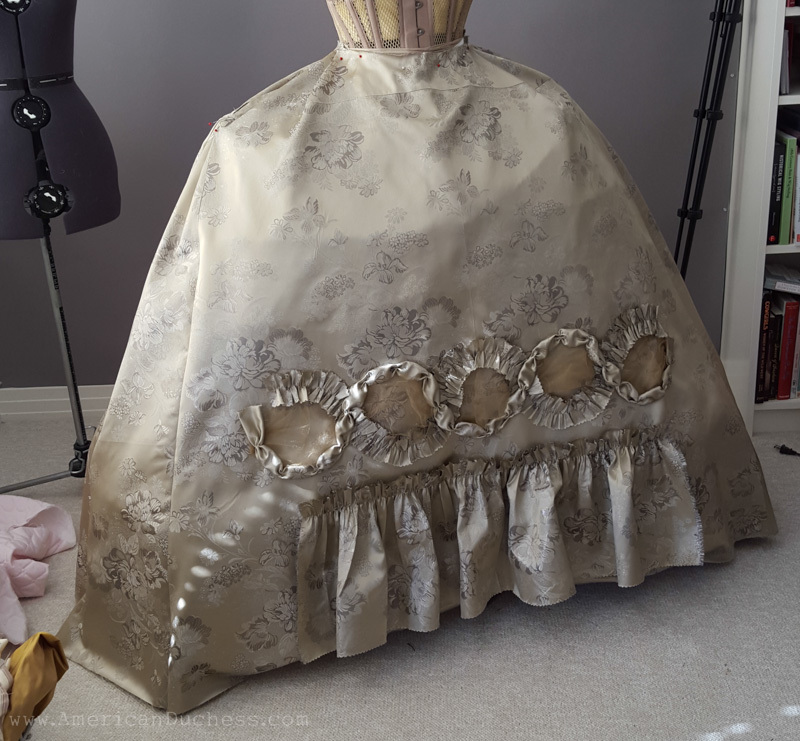 Once the back pleats were stitched to the lining, I cut out the back shape (according to the lining piece), cutting the rest of the skirt out perpendicular at the waist. All that was then pleated up to about the side seam. I did this a couple times to get the voluminous skirt to lay well over the pannier. 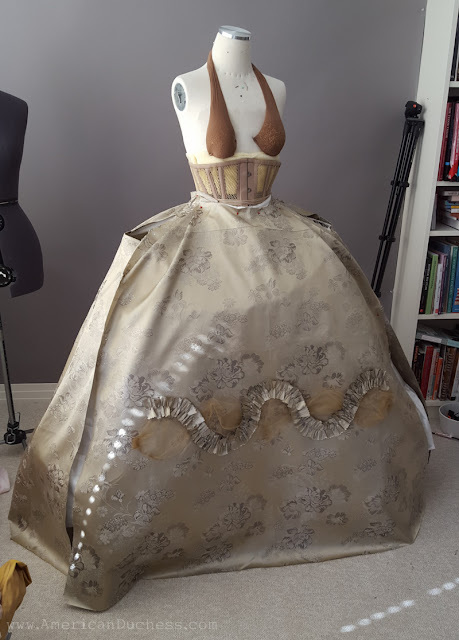 It's tricky, and effected the train of my gown quite a lot, which indicates to me that I still didn't have enough width in my back pieces for the method/pattern I used to fit over the side of the pannier. Pleating the back widths around to the side of the pannier. Easier said than done. Next up were the front skirt panels. Lots of work here, interfacing, lining, and trimming these. They're heavy and stiff, keeping the right line and showing off all the fluffy stuff that makes these gowns so impressive. Front skirt panels in progress. These pieces are interfaced and lined in lightweight silk taffeta. The trim for the whole gown is alternating pinked-and-ruched self-trim and puffed "candy wrapper" self-trim, framing large puffs of gold tulle in a circular design. 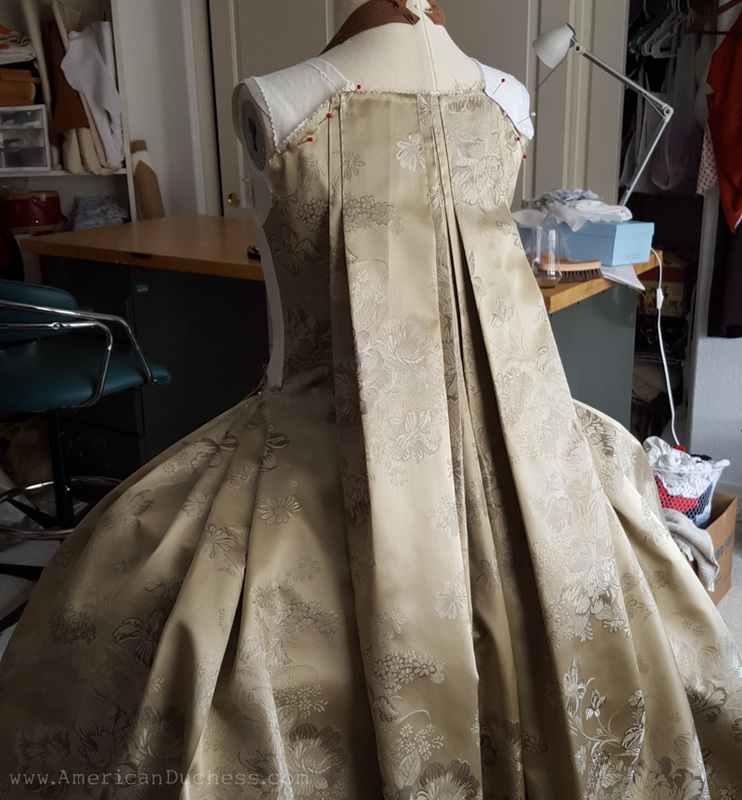 This is all put on by hand and has been the most time-consuming on both the petticoat and gown so far. 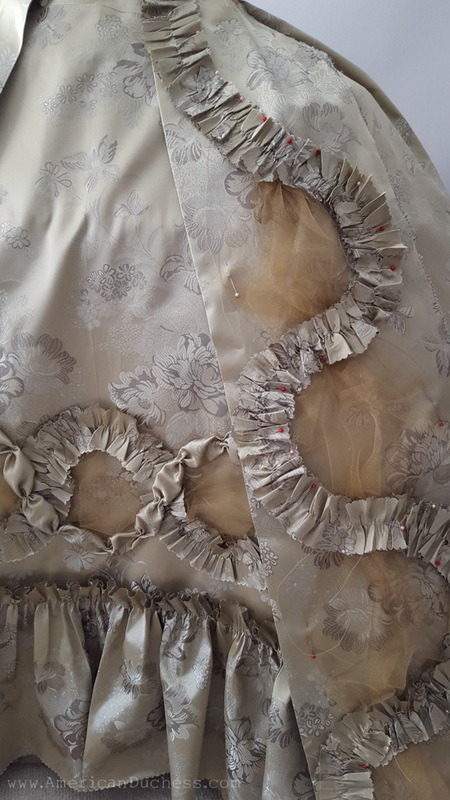 Trims - finished on the petticoat and in progress on the gown front panels. Now I have the bodice, sleeves, and stomacher to do. 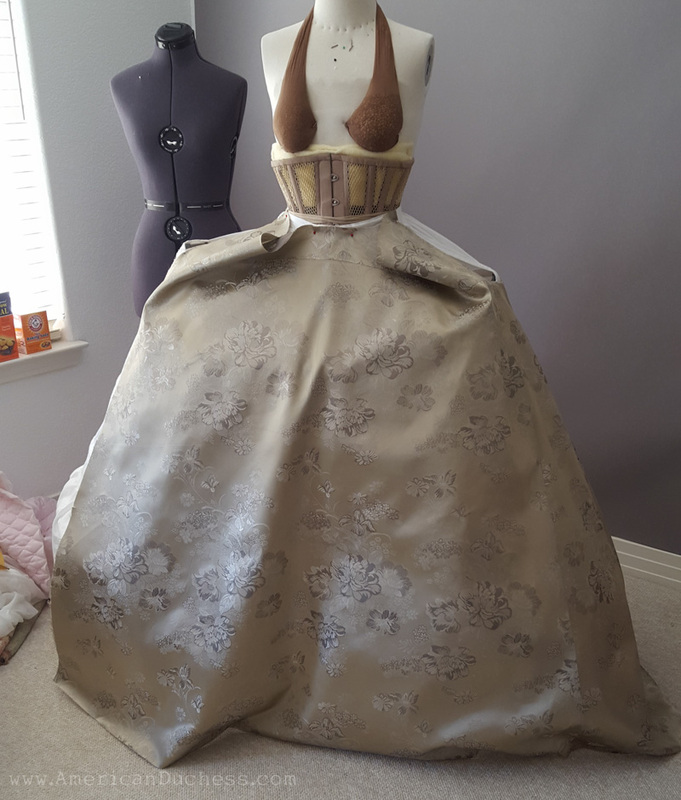 I draped the bodice piece with the robings extension last night, and will mount the fashion fabric tonight. I've never used the method of robings + pins, but I'm looking forward to the adjustability this offers, both in construction and wearing. 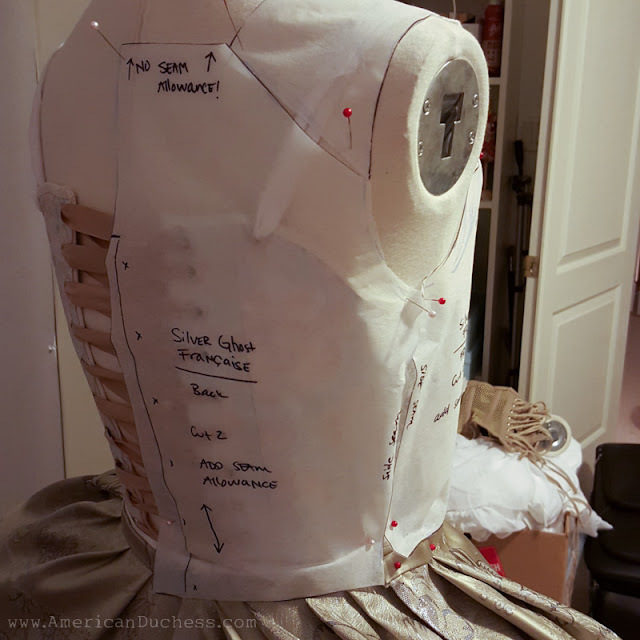 Draping the pattern for the bodice front with robings, which will be faced and trimmed. 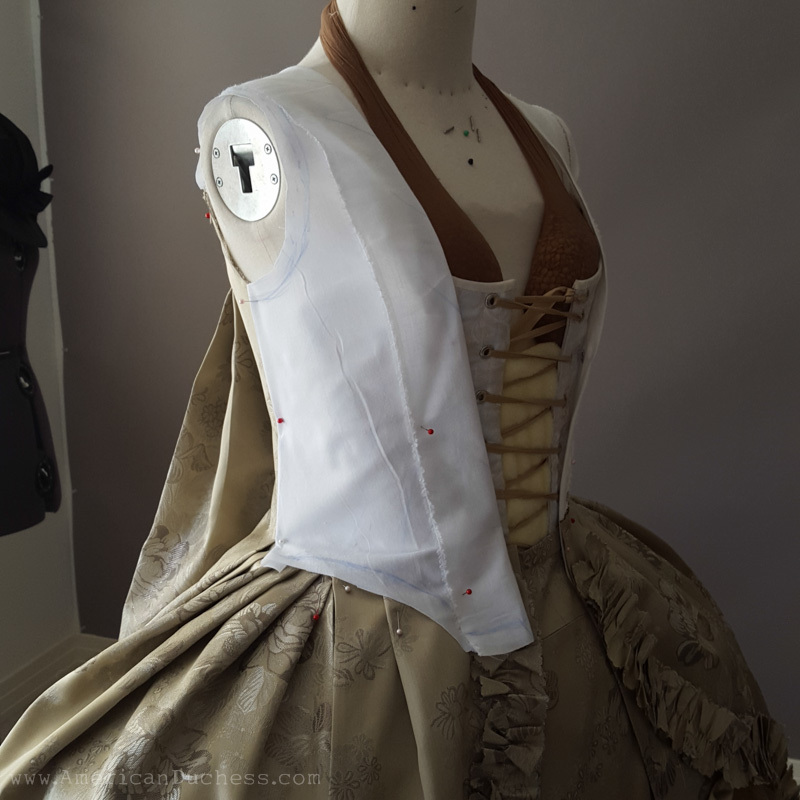 The stomacher is pinned under there robings, which then fold back (as shown) to cover the pins. The sleeves aren't going to be too bad for patterning (she said). Sacque sleeves can be pretty loose, with pleating at the back of the shoulder, which makes them way easier to set. I already have the lace sleeve flounces, too. Costume College, the first weekend in August. I have about two weeks to finish, eeeek! The fabric is amazing!!! It looks like it came straight out of a portrait!!! You are doing an extraordinary job on it!!! 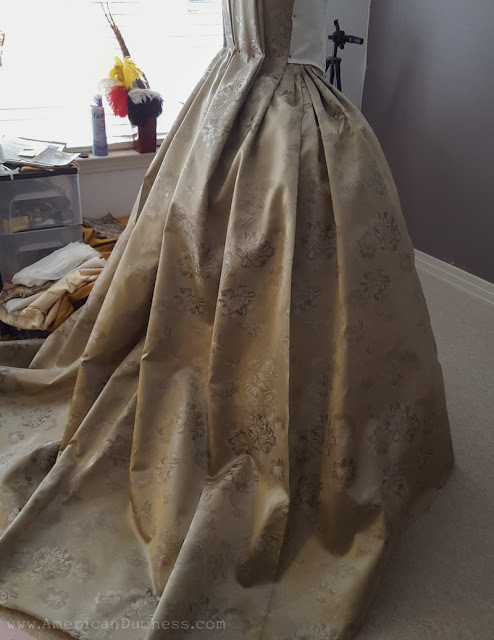 This is so incredibly beautiful already; I can't wait to see the finished dress. I don't sew historical costumes but this is my very favorite style!!! Thank you! It's a very flattering style. HOLY FRIGGIN' HELL THIS IS AMAZEBALLS. OH MY GOODNESS!!! I love this SO much, I am salivating it is so glorious and I cannot wait to see you in all this incredible soft silver sensationalness!!!! merci beaucoup , cela va m'aider considérablement pour la robe que je suis entrain de coudre . I find it somewhat ironic that the trim always ends up the most time-consuming part of everything. I recently finished a pet en l'air - and the base took me a not very work-intense weekend. The furbellows, however.... just ruffling all of them so that they would look right took me more than 12, very work-intense hours. I do have a question though: your fabric looks fairly heavy - is it actually that heavy and is this a problem for the drape of the gown? I ask because I am the lucky owner of a few yards of wonderful brocade fabric and wonder what I can do with it. Indeed, it is kindof funny that way. The fabric is quite heavy, but not crazy - I'd call it a medium weight upholstery brocade. I have found for this particular style that you want a bit of weight and stiffness to get the skirt to keep its shape. 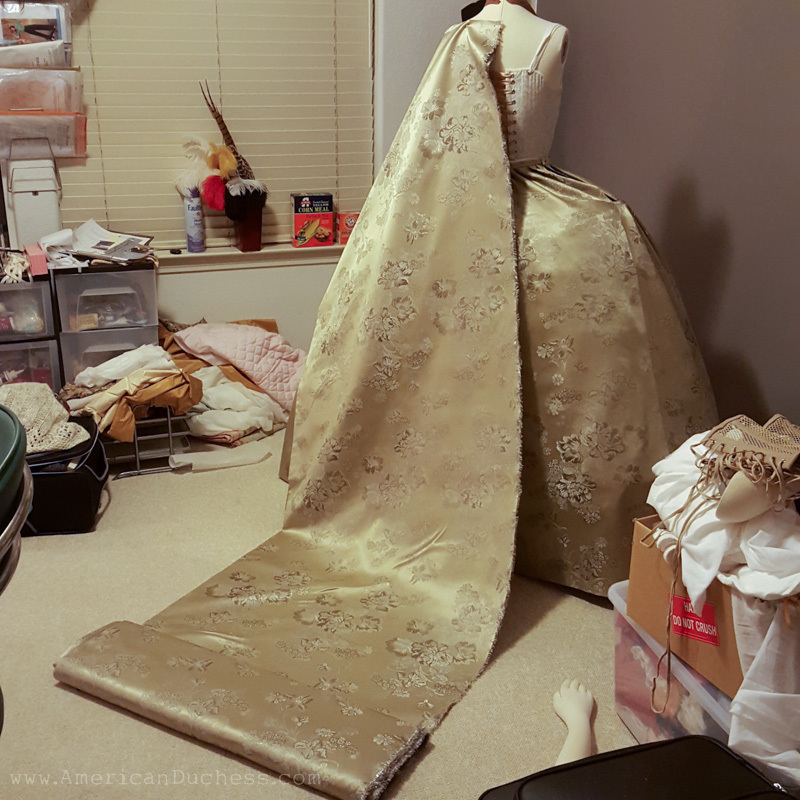 If I were using silk taffeta, I would most likely still interface the front skirt panels and hem. That fabric is just inspirational !! I love how each photo of it makes it look like a slightly different color -- now grey, now beige, now gold, underneath the basic silver. Break out the tiara baby, La Reine est arrivee! Ughh... SO gorgeous! That will without a doubt be the most elaborate gown at Costume College....EVER. Can't wait to see the finished dress!!!! Oh, wow! I love how the fabric changes colour depending on how the light hits it. I can't wait to see it finished! It looks absolutely stunning. I love anything historical, and the thought that there are people nowadays dressing up like this... wish i knew how to sew. This dress will be a knockout when done. The material is gorgeous! Wow, it is looking beautiful and stunning. The fabric is nice and colors also perfect. I love it, thanks for share with us. This is going to be incredible!! I can't wait to see pictures of you wearing it!! Huzzah!!! This looks so gorgeous thus far! I have never made anything with the francaise back pleats until this week, and I think they are even more fun than I thought they'd be! The gold net gives this dress a really extant/antique look, I can't wait to see the completed gown! I really enjoy your blog, so I have nominated you for a Liebster Award, (which you are free to accept or refuse.) The Liebster Award is basically an award that is by bloggers, for bloggers. It's passed from person to person to encourage connection and support within our writing community, and to aid in the discovery of new and upcoming bloggers. Thanks for the great blog! Lauren, what a beautiful costume! I have a question: how did you join the plastic zip ties together in the grand pannier?